MyBinding.com is glad to be your source for paper joggers and paper jogging machines. These paper joggers are used to help eliminate static in your documents and to align your pages for punching, binding, cutting, mailing or shipping. You can use one of these units to ensure that all of your pages are perfectly aligned before you finish or cut them. Or, you can use a paper jogger to help align bills, mailers and invoices for mailing, folding, inserting or opening. This is very important if you are using a letter opener since you really don't want to slice into the content of your envelopes. Here at MyBinding, we carry a number of choices that are equipped with a single bin, multiple bins or a flat top. We even have specialized units that are designed for envelopes and larger format stocks. Choose the bin configuration and size that best fits the items that need to be jogged. Check out the options below and if you have any questions feel free to give us a call. We are here to help. Table size of 17" x 17"
Table size: 17" x 10" x 8-1/2" with three bins 5" x 8" x 9-1/2" ea. Media Size: Up to 4" x 8"
Bin Size: 3.5" x 8.75"
Media Size: Up to 11" x 17"
MyBinding.com is glad to be your source for paper joggers and paper jogging machines. 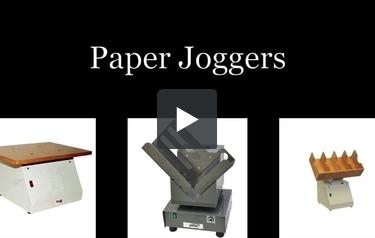 Paper joggers are used to help eliminate static in your documents and to align your papers for punching, binding, cutting, mailing or shipping. You can use a paper jogger to ensure that all of your pages are perfectly aligned before you finish or cut them or you can use a paper jogger to help align bills, mailers and invoices for mailing, folding, inserting or opening. We carry a number of paper joggers that are either equipped with a single jogging pin or multiple jogging pins. We even have special joggers that are designed for envelopes and larger format stocks. If you have any questions at all, give us a call and we can help you find the right jogger for your company. When image matters, MyBinding.